A crime is classified as terrorism only if it is politically motivated. Authorities don't yet know why Austin bomber Mark Anthony Conditt planted explosive devices around the city, sending ripples of terror through Texas' capital. That means they cannot determine whether he was, in fact, a terrorist — though many say he ought to be called one. According to the federal government's definition, a crime is classified as terrorism only if it is politically motivated. With the motive for the package bombings still unclear, experts say authorities are being appropriately cautious in not calling the bomber a terrorist. 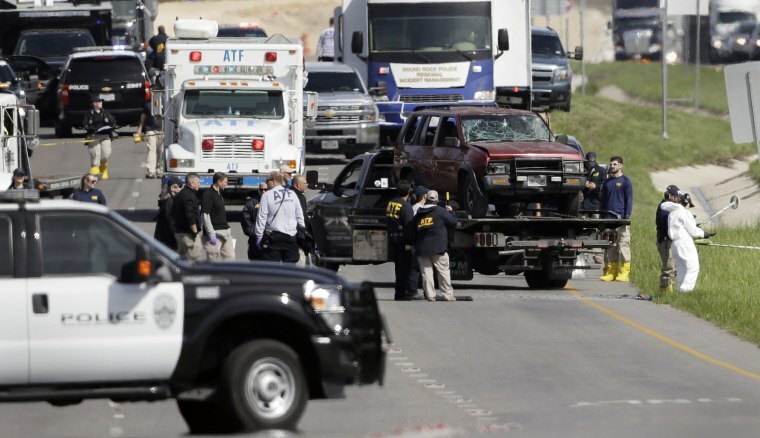 "What occurred in Austin in the past few weeks certainly, without a doubt, terrorized people," said Bruce Hoffman, a senior visiting fellow at the Council on Foreign Relations and the author of "Inside Terrorism." "But just inducing fear and anxiety is insufficient to say that it's terrorism. Terrorizing and terrorism are two different things." In a 25-minute video confession Conditt recorded before he blew himself up as authorities closed in on him on Wednesday, Austin police chief Brian Manley said Conditt did "not at all mention anything about terrorism or anything about hate." That left authorities with no clues about whether the attacks, several of which seemed to target minorities, were hate crimes, terrorism or something else. Hate crimes can overlap with terrorism, but not always, said Chuck Strozier, director of the Center on Terrorism at John Jay College of Criminal Justice. "Racist motivations are not necessarily political," Strozier said, "unless you find on his computer that he's been going to neo-Nazi websites and seeing the violence and read right-wing propaganda." Under that scenario, Strozier said, the bombings could be seen as "a process that would lead to a greater race war." "Then I think there would be no question of whether it would be appropriate to start talking about it as terrorism," he said. Even without evidence of that kind, there have been growing demands to call Conditt a terrorist. On Monday, before Conditt was publicly identified as a suspect, three members of the Congressional Black Caucus requested in a joint statement that the bombings be classified as "ongoing terrorist attacks." A day later, University of Texas at Austin police Chief David Carter told The Dallas Morning News that "whatever you call it, technically under federal law or anything, it is clearly a terrorist act." After it was revealed that the man behind the bombings was white, the calls grew louder. Pakistani-American comedian Kumail Nanjiani tweeted, "If this terrorist bomber was a brown guy, my mom wouldn’t be able to leave her house for a week." And political comedian Tim Young tweeted: "Did anyone call the Austin Bomber a domestic terrorist? Terrorists come in all shapes, sizes, colors, and religions." The calls for Conditt to be considered a terrorist follow criticism of how and when President Donald Trump has used the word "terrorism" in the past. Critics say he has been quick to use the word when suspects are Muslim, but appears reluctant to use it otherwise. Those concerns peaked last August, when members of Trump's own party, including Sen. Marco Rubio, R-Fla., slammed Trump for not calling a deadly confrontation at a white supremacist rally in Charlottesville, Virginia, "domestic terrorism." In the case of the Austin bombings, the White House said this week that the attacks did not appear to be terrorism. Press Secretary Sarah Huckabee Sanders tweeted Tuesday that Trump was mourning the victims and added, "There is no apparent nexus to terrorism at this time." "We don't know if he did it out of a political agenda, so he meets the definition of terrorism on every level — except the motivation." For Ami Pedahzur, a government professor at the University of Texas at Austin who has written extensively about terrorism, the bombings that paralyzed his hometown these past few weeks have felt a lot like terrorism — even if officials haven't called it that. "Basically when we talk about terrorism, we look at something that is politically motivated but is aimed at generating fear among people and altering their behavior," Pedahzur said in a phone interview from Austin. "We are feeling terrified opening packages." "In terms of [the bomber's] impact on everyday life here in town, it's absolutely terrorizing," he added. "We don't know if he did it out of a political agenda, so he meets the definition of terrorism on every level — except the motivation."